Why Are French Fries Unhealthy? The more junk food and fats consumed, such as the fat in French fries, the higher the risk of becoming overweight. According to the American Heart Association, this can increase cholesterol levels in the blood. Despite originating in Europe, French fries are one of the most popular American snacks. They have become a staple component of nearly all fast-food and restaurant menus. Foods, like French fries, pizza, and chocolate, can trigger the release of dopamine in the brain that makes people ‘feel good’; somewhat similar to what happens during drug abuse. This causes the body to long for more such food items, as the brain tricks us through the hormone release. French fries contain ‘empty calories’, meaning they only add calories to the body and have poor nutritional value with no minerals and vitamins. These take up space in the stomach and reduce intake of other healthier food items. Regularly eating French fries can result in overweight and obese children, since kids may find the snack more desirable and consume them in large quantities. The United States Department of Agriculture (USDA) “ChooseMyPlate” warns that preschoolers and children may lose out on valuable nutrients if they are permitted to fill their stomach with empty calories from solid fats and added sugars. Thus, ChooseMyPlate recommends over-baked fries to french fries for young children. French fries contain high amounts of carbohydrates, saturated fats, and salts that are not only tasty, but unhealthy. The more junk food and fats consumed, such as the fat in French fries, the higher the risk of becoming overweight. Also, according to the American Heart Association, this can increase cholesterol levels in the blood. High blood cholesterol is a key risk factor for type 2 diabetes, heart disease, and brain stroke. The same holds true for carbohydrates, which when consumed excessively, can potentially cause cancer, diabetes, and heart conditions. High salt levels (with high sodium) in French fries put people at risk for hypertension that can lead to long-term adverse health conditions, affecting the heart and kidneys. French fries (and even potato chips) are prepared by high-temperature cooking or frying (over 120 deg. C), which gives rise to a chemical called acrylamide. Both the National Toxicology Program and the International Agency for Research on Cancer have classified acrylamide as a “probable human carcinogen”, since lab studies on rodents have provided evidence of many cancer types. Though study research on humans are still underway, the WHO and FAO have highlighted human health concerns from dietary acrylamide. Pregnant women and lactating mothers are especially advised to avoid fast foods, like French fries. Jung, M. Y., Choi, D. S., & Ju, J. W. (2003). A novel technique for limitation of acrylamide formation in fried and baked corn chips and in French fries.Journal of Food Science, 68(4), 1287-1290. Becalski, A., Lau, B. P. Y., Lewis, D., Seaman, S. W., Hayward, S., Sahagian, M., ... & Leclerc, Y. (2004). 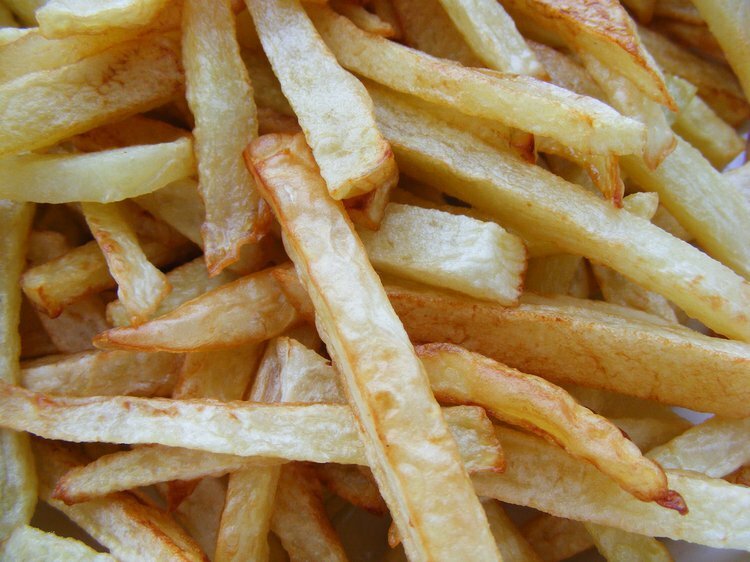 Acrylamide in French fries: influence of free amino acids and sugars. Journal of Agricultural and Food Chemistry,52(12), 3801-3806.